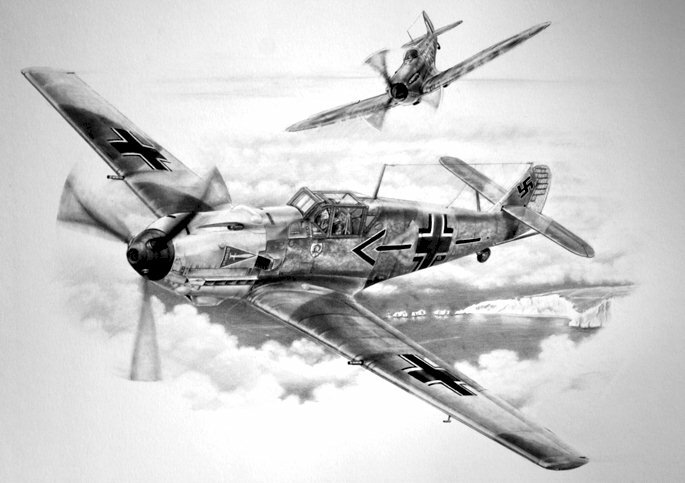 The newest work by aviation artist James Baldwin is this pencil drawing showing the aerial duel between F/Lt John Dundas (609 Squadron) and the German air ace Major Helmut Wick (JG 2) over the Isle of White in the afternoon of 28 November 1940. At the time, Wick was a real celebrity in the Jagdwaffe, not only being the highest scoring German fighter ace, but also the youngest Major in the Luftwaffe and commanding officer of Jagdgeschwader 2 “Richthofen”. During the aforementioned encounter Wick shot down a Spitfire, bringing his total to 56. However, this victory was also to be his last. Turning for France, his Bf 109 was attacked by F/Lt John Dundas. Wick was forced to bale out over the English Channel. ONly seconds later, Dundas was shot down by Wick’s wing-man Rudolf Flanz. Both men were lost.